Ice is usually acceptable if it doesn't cover the entire pond for more than a week. To keep the top of the pond free of ice, construct a temporary "greenhouse" made from carpenter's plastic sheeting (in the shape of an a frame if you live in a climate that collects snow). Floating a basketball on the surface often provides an easy-access hole for gas and oxygen exchange, but it is unreliable and difficult to maintain. The best and easiest solution for ice-over is to use a pond heater or de-icer. 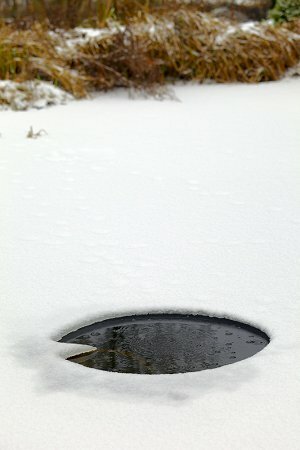 Although "pond heaters" are not made to actually heat your pond (not like a swimming pool or aquarium), they ARE made to keep a gas exchange hole open during times of freezing surface. Don't, under an circumstances, chip or chop away at the surface ice as this creates serious, injurious shock waves through the water. If your pond is in the ground, keep it full of water. Turn off your pump and filter when freezing is imminent. Store the pump in a bucket of water somewhere that it won't freeze. The practice of keeping your pump wet will extend its life by preventing the O rings and seals from drying out. If you have an air pump installed, let it keep pumping unless the water will freeze deep enough to freeze the pump. Keeping a constant stream of air bubbles will help to keep a hole in the top of the pond in all but the very coldest temperatures. Plants need some tending as winter approaches. Lift all of the plants and remove vegetation to within 2" of the crown. If your pond is deep enough that it will not freeze below the rootstock, lower your plants in their containers to the bottom - at least 30-36" in northern climates. If the pond will freeze below the rootstock, remove the plants, wrap the root stocks in moist newspaper, cover with a plastic bag and store in a cool, dark place. Check them often enough to be sure that they stay moist. Storage in a garage or basement is usually ideal. Temperature should remain between 40-60 degrees F.
Winterizing tropical plants in northern climates is challenging at best. Sometimes it is just as economical and convenient to purchase new plants in the spring. Feed your fish increased rations in the early autumn, then gradually cut back the amount of food as the temperature drops. Feed a lower protein food as the temperature gets cooler until you stop feeding altogether below 45 degrees F.
Leave the fish in the pond if it will not freeze solid. If the pond is above-ground, drain your pond, bring your fish into an aquarium and winterize your plants as described above.